All package are designed specifically for each client. These are suggestions and jumping off points for your own adventure. They lay the groundwork for what will eventually become one of the most exciting and unforgettable moments of your life. Go Get It’s mission, our reason for being, is to weave your dreams into reality. Our ultimate fantasy packages do just that. Forget your every day reality. When you experience a Go Get It Ultimate Fantasy package, you’ll question whether it actually happened. ‘Cause really, how often do dreams actually come true? Have a Broadway Show Created for Your Marriage Proposal! Do the unthinkable and propose to your girlfriend or boyfriend when they least expect it: Onstage during a seemingly real (but 100% fake) Broadway show! Go Get It puts a truly theatrical spin on the “play within a play,” as we craft a marriage proposal within a Broadway Show! The entire production: the show, the actors, the audience members, and ushers are all merely players. They have their entrances and exits and each one’s act a part of your surprise! Imagine your sweetheart’s reaction as they realizes the entire show, including the script, the actors and the songs, have been staged just for them…and all the stories they will be sharing with friends and family for a lifetime. Event Location: New York City, Los Angeles and Louisville, KY. Declare your love in the most unique way possible! Imagine living the life of a sensational movie star… The parties, fans, publicist, assistant, driver, clothes, the A-List treatment. What if you could give the love of your life the feeling of being the most-sought-after-person in the world for a day? Go Get It Events and Proposals will design a fantasy surprise allowing them to experience the life of a glamorous and pampered movie star. Whisked to the finest luxurious destinations via chauffeured car service, your loved one will be sent on an exciting and incredibly romantic spree through Los Angeles guided by actors playing his or her devoted fans, the paparazzi and other tempting characters. Imagine their surprise when they see themselves on the cover of their favorite magazine or even on a billboard announcing the release of their newest film! They will enjoy spas treatments, upscale boutiques and the most unforgettable night of their life. After a whirlwind day, they will be led to the beach where they follow a rose covered path to find you at the beach at sunset. Your lover will be in tears as they approach you! No detail of this deliciously enchanting fantasy will be left untouched. Event Location: New York City, Los Angeles. Go Get It Events will roll out the red carpet and deliver a once in a lifetime experience. As your lover exits their home, work or hotel lobby, they will get the surprise of their life as a large group of fans, press and paparazzi rush to them clamoring with excitement. We guarantee to produce surprise that quickly turns into heartfelt laughter, enjoyment and amazement. Whether you’re playing the ultimate joke on your favorite wallflower or giving your superstar the attention they crave, no one will ever forget their 15 Minutes of Fame! For proposals, anniversaries or birthdays! Imagine a moment of complete privacy right in the middle of Manhattan’s mayhem, where you’re literally up above it all. We can provide a rare quiet way to spend an evening in the heart of New York City surrounded by that famous energy with a romantic dinner on a rooftop terrace. Gaze at the expansive view and sip champagne before taking your seat at the elegant table set for two. Our chef will create a personalized menu just for you, complete with wine and dessert. Though you hardly need additional décor as the city lights flicker below, we’ve completely set the scene and created an elegant atmosphere with beautiful flowers, petals and candles for you to enjoy your delicious meal and gorgeous date. A fantastic and unique way to surprise your loved one! Winter in New York, romance is in the air. The Christmas tree, snow falling softly in Central Park, the sweet scent of roasting chestnuts fills the air. Go Get It turns New York into a winter wonderland as you propose at Central Park’s ice skating rink. The evening’s adventure begins with a personalized tour of New York City. A series of romantic events and exciting stops designed by you and Go Get It, send your lover on a New York escapade. Each stop brings her closer to you, finally leading her to the skating rink. As the lights over the rink go down, and her favorite song comes over the speaker, you step on the ice and skate towards her, ring firmly in hand. 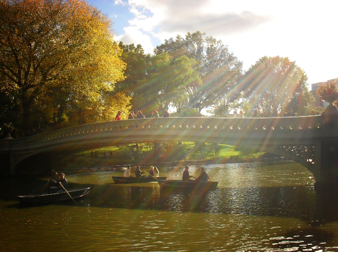 This highly creative and expertly choreographed proposal takes place near the famous Central Park Boat House. Complete with your own actors and musicians, you will enjoy a series of surprises while gliding on the water. As you row your lover on the picturesque lake, you will be met by a cast of characters who will help set the scene for your proposal. Our most popular service, we will work with you to create your own fantasy event and make you look like a hero! Using your unique history and personality, we will customize an escapade your lover will be bragging about for years to come! Perfect for that hard-to-shop-for person. For Proposals, Birthdays or Anniversaries! Get ready to go above and beyond! 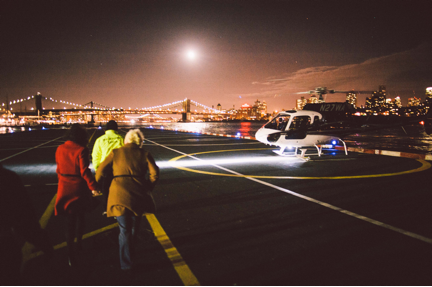 Your majestic day in Manhattan starts off with an astonishing helicopter tour of NYC. From a high-flying adventure above the city, to deep relaxation on the ground – your next stop is the spa, where the highly trained staff will soothe your mind and body. After your spa treatment you’ll be camera-ready for your “Top of World” fashion shoot at the Top of the Rock at Rockefeller Center. A professional photo shoot captures iconic photos of you both that will last a lifetime. Next, enjoy a beautiful and relaxing sunset dinner cruise around the majestic New York Harbor. A relaxing way to spend an afternoon in the park, this package sets the stage for a romantic affair you won’t forget. Surprise your lover with a perfect picnic that is set up for two. Blankets, pillows and a picnic basket complete with champagne, wine and your favorite food awaits you. A musician will casually approach your picnic paradise playing your lover’s favorite song(s). Relish a wonderful afternoon with your lover before enjoying a very romantic night. 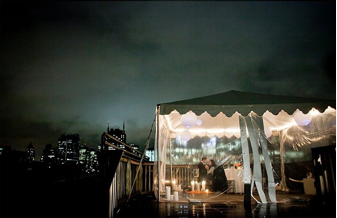 Celebrate this most special occasion amongst the stars with the Manhattan skyline as your backdrop. GGIE will transform a Central Park gazebo into a twinkling fairytale setting. After a romantic carriage ride through the park, follow a candle lit path to a lantern lit gazebo. Champagne, wine and desserts will be waiting for you both. Rose petals and hanging lights will be delicately placed throughout the gazebo. A discreet musician will play your favorite songs, while you enjoy a relaxing and romantic evening. Need Date Ideas? Click here!